As the founding member and front man for the band Mountain, Leslie West has established a reputation as one of the most ground-breaking and prominent musicians in rock history. Over the past five decades, he’s played and jammed with a wide range of guitarists from Jimi Hendrix to John McLaughlin – to modern contemporaries like Eddie Van Halen and Joe Bonamassa. The list of artists he’s shared the stage with, along with the stories that go along with them are rich and plentiful. West also had the honor of being voted one of the top 100 greatest guitarists in the November 2011 edition of Rolling Stone Magazine. While some aspects of life may not have been so kind, most notably the loss of his lower right leg due to complications from diabetes, West (who recently celebrated his 70th birthday in October) isn’t interested in slowing down, and continues his ingenuity in the recording studio. On West’s 16th solo album Soundcheck the opening track “Left by the Roadside to Die,” sets the tone with the rocker’s voracious vocals and solicitous acoustic slide, before breaking into a steady thunderous beat… On track two West adds his gritty interpretation of Tracy Chapman’s “Give Me One Reason,” giving it a gigantic rock sound; a very appealing result. “Here for the Party” is a seventies style rock tune played in distinctive Leslie West fashion. One of the more fascinating tunes on the album is West’s take on “You Are My Sunshine.” The shift from a major to a minor key with slowed down tempo, along with Peter Frampton’s fret work and West’s slide, makes for a very thought-provoking interpretation. Surprisingly, it is one of my favorite selections on the album. “Empty Promises/Nothin’Sacred” is a heavy rock tribute to AC/DC, and “A Stern Warning,” is a solo acoustic piece that West dedicates to his friend Howard Stern. Curtis Mayfield’s classic “People Get Ready,” receives a firm make-over, and Queen’s Brian May makes an appearance (this track originally recorded over 10 years ago) on “Going’ Down” along with Bonnie Bramlett and Max Middleton. “Stand by Me” pays tribute to Ben E. King who passed away in April 2015, and the young sensation Arielle adds her vocal chops. West features his bass player Rev Jones and his splendid take on the Beatles “Eleanor Rigby.” The closing track is an edited down live version of Willie Dixon’s classic “Spoonful” that West performed with his friend, the late great Jack Bruce back in 1988 originally from the album Theme. 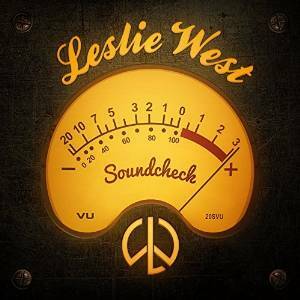 It’s been a while since I’ve listened to Leslie West, and before playing Soundcheck I wasn’t sure what to expect. Produced by Grammy Award winning Mike Goldberg for Provogue Records/ Mascot Label Group, West puts together an album overflowing with authority and vibrato that showcases his enormous talent. It really is a fun album! The mixture of styles won’t necessarily be everyone’s cup of tea, but at the root of this album you can still feel the blues, and of course that inexplicable Leslie West tone and personality.